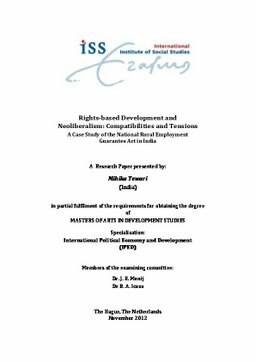 This paper seeks to examine, to what extent right-based development is compatible with neoliberalism using the case of the National Rural Employment Guarantee Act (NREGA) in India. This Act was legislated in 2005 and is often referred to as a ‘ground-breaking piece of legislation.’ The paper first discusses various theoretical points of view about the relationship between neoliberalism and rights-based development (RBD). Subsequently, it explores the genesis of neoliberalism and RBD in India, focusing on aspects that make RBD and neoliberalism unique and the historical reasoning for the emergence of these characteristics. The case of NREGA is further used to illustrate the complexity of the relationship between RBD and neoliberalism through analysing the process behind the Act and the features of the Act itself. The NREGA demonstrates compatibility with the neoliberal system but also brings to the fore several tensions. Interestingly, this case study shows that the RBD and neoliberalism, in the case of India, have a more complex relationship than assumed by certain academics.